Note that this is not the same "Swing Offense" taught by Coach Bo Ryan at Wisconsin, an offense that combines elements of both the flex offense and the UCLA offense. Our "Swing" offense is really nothing terribly original. It is a simple pass, cut, and fill offense that offers a variety of counter options based on how the defense chooses to play. The basic set up is a 2-3 formation with the wings positioned free throw line extended outside the three-point line and a post player positioned at the free throw line (diagram 1). The motion of Swing is initiated with an entry pass to the wing. On the entry pass a hard basket cut is made and the player exits to the wing area opposite the ball. All other perimeter players "wheel" around to fill the open spots in front of them i.e. O2 fills the spot vacated by O1, O3 fills O2's spot, and O1 fills O3's spot after making the basket cut. (diagram 2). After the ball is entered to the wing and a basket cut is made, we look to reverse the ball from side to top to side. (diagram 3). Once the ball is reversed and another entry is made to the wing, the basic motion is initiated again beginning with a basket cut. As stated earlier, all of the options we use out of the "Swing" are counters to how the defense is playing. One counter would be used when the wing is looking to reverse the ball after a basket cut and the X2 defender is denying the pass (diagram 4). O2 recognizes the reverse pass denial and back-cuts hard to the basket, initiating the basic swing motion. Another counter option might occur if the wing entry is being aggressively denied. In diagram 5, O2 cannot enter the ball because O3 is being denied. O3 reads the defensive overplay and immediately plants the outside foot and back-cuts to the hoop. If O3 receives the backdoor pass and O5's defender drops off to help, O5 should move into the mid lane area to look for a drop off pass from O3. Another way to counter the wing entry denial is a simple dribble entry as shown in diagram 6. Your post player O5 at the free throw line can be a threat as well. We give our posts the options of rolling into the low post at anytime as long as it is after a basket cut. We give the basket cut priority so as to not end up with 2 players cutting to the same area at the same time (diagram 7). Our posts are given a 2 count and then they must either relocate back to the free throw line until another basket cut is made. 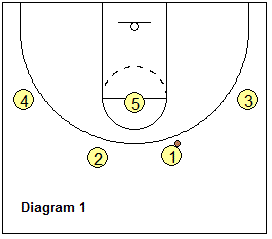 O5 can step away from the low post and set a ball-screen for the strong side wing and play a 2-man game (diagram 8). As I said, this is not a terribly original offense, nor is it terribly complicated. It does offer a lot of flexibility during its motion. I’ve provided some of the counters we’ve used and been successful with. You certainly can play around with the set and motion and come up with options or set plays on your own. Another aspect to this offense that I like is that it can be used as a half court man to man defensive drill. By removing the post at the free throw line and playing 4 on 4 you can work on your help side positioning, jumping to the basketball, denial, close outs, etc…. The offense creates the motion requiring use of those defensive skills/concepts. Comment from Coach Gels... Coach Genis submitted this article a number of years ago, before the Read and React offense came out. But if you look at it carefully, this offense is somewhat similar to the first few layers of the Read and React offense... pass and cut, circle motion on the perimeter, back-cut when overplayed, dribble-at back-cut, etc.